At the outset of 2015 I had intended to report on each race I had completed. Here it is July and I have at least 5 races under my belt and not one blog post reflecting on my experience. I can still redeem myself. 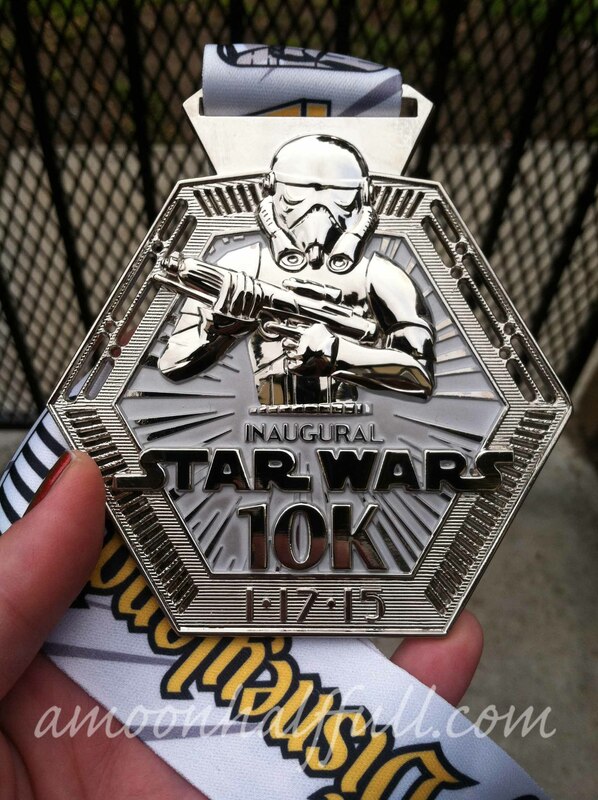 Six months later I bring you my race report for the Star Wars 10k. Facts might be a bit fuzzy. 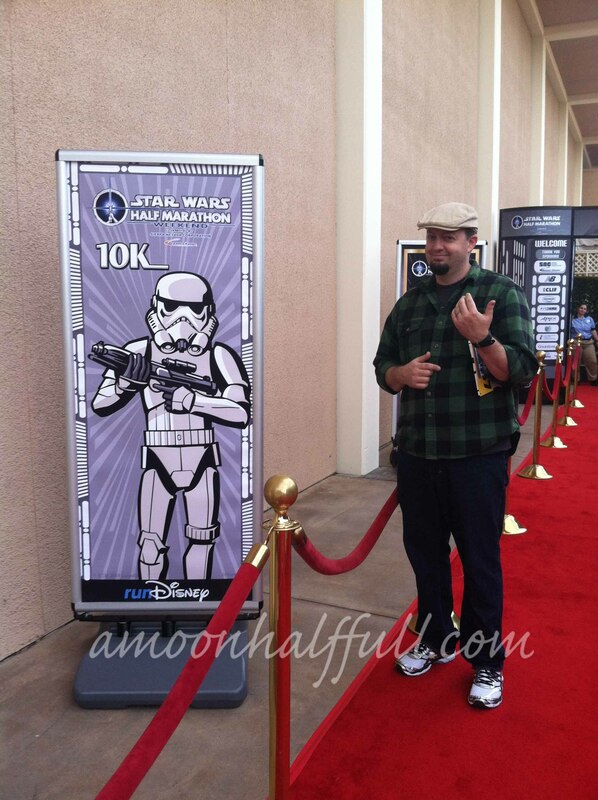 I had already had my heart set on doing the San Diego Triple Crown series by the time Run Disney announced the Star Wars Half Marathon weekend. 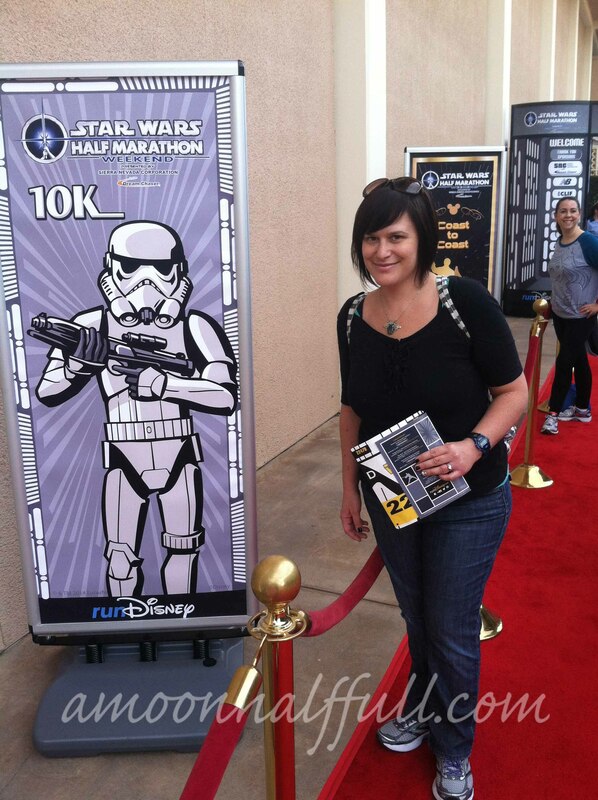 The Star Wars Half was the same day as the Carlsbad Half, 1/18/2015. I wasn’t willing to give up that goal. 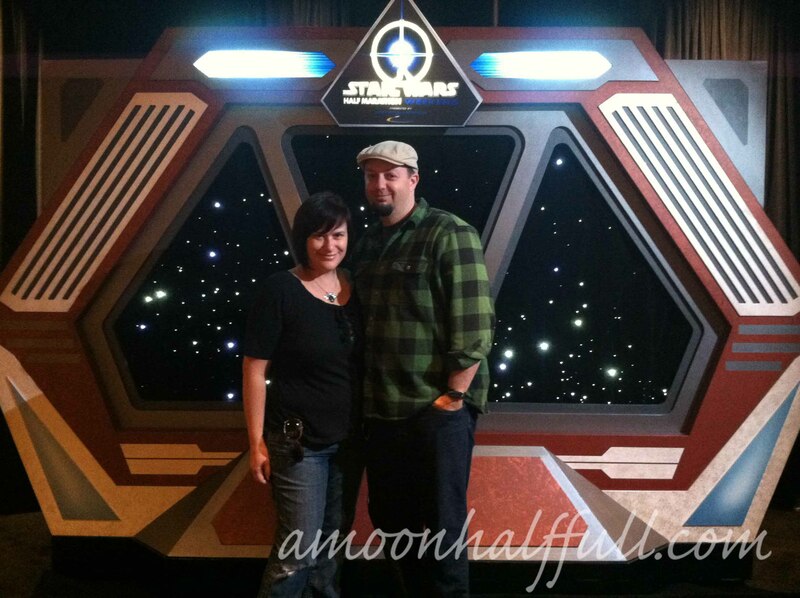 Not wanting to miss out completely on the Star Wars weekend where so many friends and my hubby were excited to race, I opted to do the Star Wars 10K which was the day before the half. Registration was, as always, a scramble. The fact that all of our friends who wanted to get into races during this weekend were able to is really an amazing accomplishment. My husband and I arrived Friday afternoon and headed straight for the Expo to pick up our race packs. I usually don’t look around the expo unless there is something specific I am looking for. I’m not that into shopping. After packet pick up, we headed over to the parks for a few hours before we met our friends for dinner at Napolini in Downtown Disney. Dinner was delicious and hanging out with our friends was a special treat. 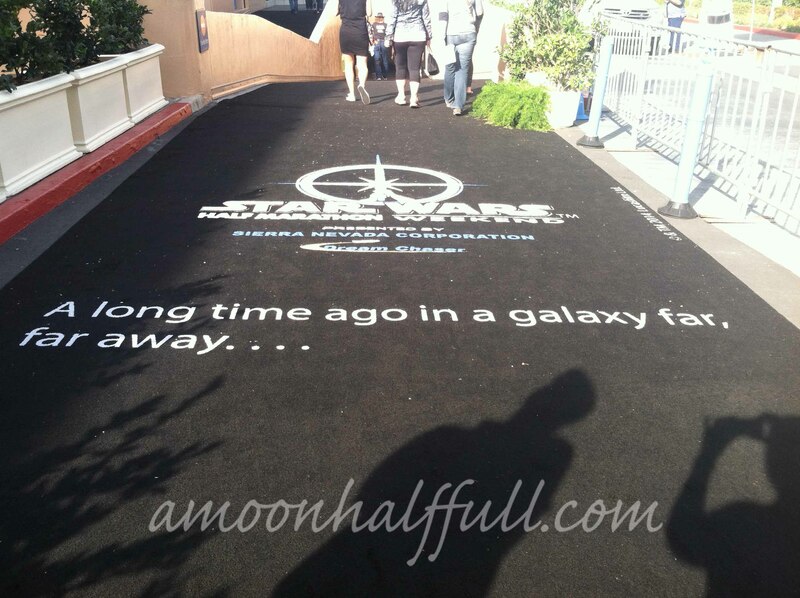 Carpet at the packet pickup entrance. 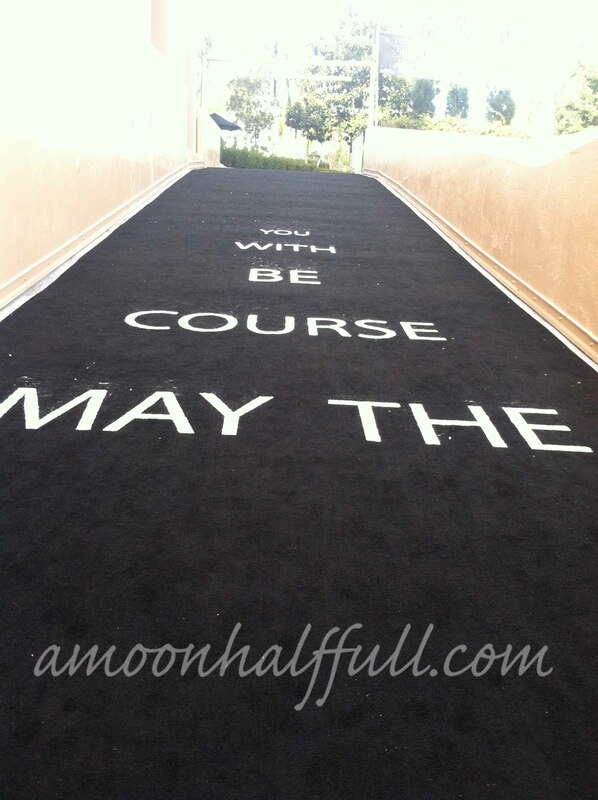 “May the course be with you” Carpet at the exit from bib pick up. After dinner we headed back to the hotel to try and get some sleep. I can never sleep the first night in a hotel. My alarm went off at 3:00am. I got up having not slept at all and told myself I was NEVER doing one of these Disney races again. Ha, yeah right! After getting dressed, we headed down to the lobby to meet our friends so we could all walk over to the corrals together. I brought a jacket that I planned to check since I thought I might be cold after the race. It was January after all. My one complaint for this race is that gear check was incredibly far from the race start. I hadn’t really looked at the map to see the set up for this and figured that I knew all the possible configurations for a Run Disney race in Anaheim. Was I wrong! We booked it fast to gear check and then hurried to get into our corrals. That was a bit stressful and lots of extra energy expended. The race started and the course was fun. Many Star Wars characters along the way. We didn’t bother taking photos with any of these characters because the lines were way too long and we were already pushing the time limit. This course went through some backstage areas I had never seen before on any other race. These are some of my favorite stretches. The one thing that is coming to mind is the plant nursery. I love seeing where the magic is really made. The 10k courses are really the most Disney bang for your buck as most the course takes place on Disneyland property. We made it successfully to the finish line and received our gorgeous Run Disney medal and then got our box of snacks. By the time we made it to the the end, they were out of bananas. We were heading straight to breakfast so it was no big deal. All in all it was a great race experience. I loved being able to participate with my husband and see our friends accomplish something new. My husband completed his first 10k. That weekend, Scott completed the challenge and set a new PR with a sub 2 hr half marathon time the next day, Tiff completed her first 10k, and T 1.0 also completed the challenge and by doing so did his first 10k AND half marathon. I am super proud of all of them. We are all in for 2016 as well. – As per Run Disney standards the race and expo were very organized. They always have a schedule of speakers that I enjoy listening to. – I love this race theme and that it has inspired a new group of people to take up running. – Getting to hang out with friends and see them achieve something worth celebrating. – The Run Disney races always start early, 5:30 am. I actually love the early starts because I like being able to finish early and eat breakfast afterwards. Breakfast is my favorite meal of the day. I just wish I could sleep well in a hotel. Perhaps I need a white noise machine. – Gear check was SO far from the start line especially if you are in one of the slower corrals. I probably will avoid checking gear next year when I do these races. – Goodie bag doesn’t include anything extra really. I think it had a sample size Cliff bar and that was it. Not a deal breaker. These races are expensive but I never feel ripped off. 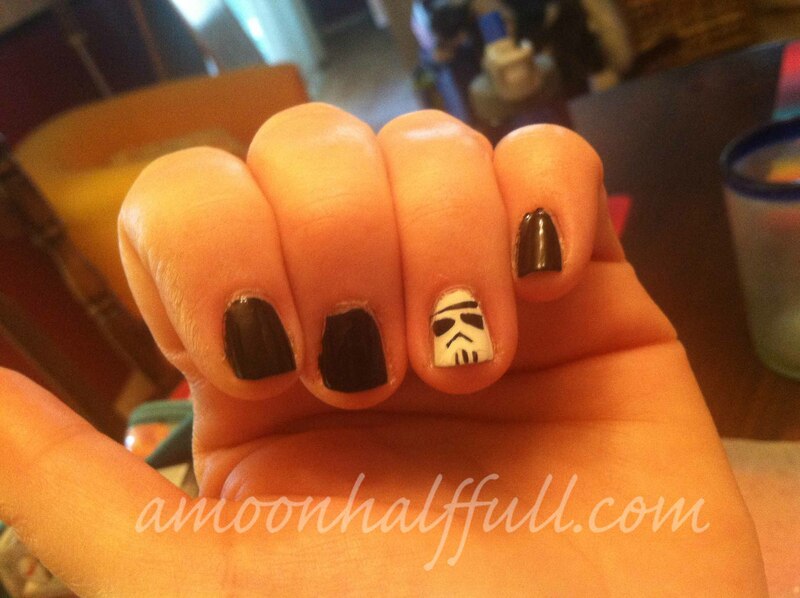 My little manicure for the race.